Soft, slightly sweet crumble bars with golden, lightly crisped edges (for those who like the corner pieces!). Kind of like cookies, but with more depth and less guilt. Eat these bars for breakfast, an afternoon delight or post-dinner treat a la mode. Sub any ripened fruit you like! This recipe was inspired by Jodi Moreno’s cookbook, More with Less. I love this recipe because the ingredients are limited and it’s easy to prepare. Did I mention these crumble bars are delicious??? In the original recipe, Jodi uses rhubarb, but the season’s over and I had fresh, ripe figs on hand from the market. I cut the sugar by about half so I could eat these for breakfast with a clean conscience...I still found them to be sweet, but appropriate for breakfast. When I originally photographed these fig crumble bars, I didn’t layer the figs, but I would recommend arranging them in overlapping layers (like a domino). Preheat the oven to 350 F and line a square baking pan with two pieces of parchment paper so they cross over one another and just fit the inside width of the pan on one side, and overlap on the other side (should look like a pharmacy cross or a + sign). In a large mixing bowl, combine the oat and brown rice flour, maple syrup, olive oil and sea salt. Spread the mixture evenly inside the bottom of the lined baking pan. Once the oven is heated, par-bake the mixture for about 10-15 minutes. Remove from the oven and allow to cool for a few minutes. Meanwhile, spread the sliced almonds onto a large baking sheet. Cook for 7-10 minutes, rotating halfway, or until golden (be careful not to burn!). 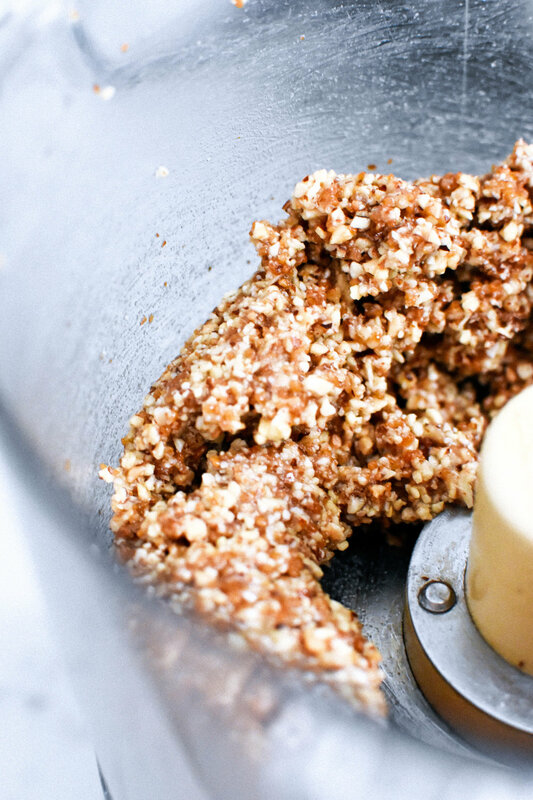 In a food processor, combine the roasted almonds, oats or oat flour, sugar of choice and butter of choice. Pulse until everything is combined, but the mixture remains course (see picture). Spread the crumble evenly on top of the par-baked crust. Arrange the figs in overlapping layers on top. Bake for 35-40 minutes or until the edges are golden brown and the figs are cooked through. Remove the fig crumble from the oven and allow to cool for 15 minute or so. Using the parchment paper flaps, remove the bars from the baking dish. On a cutting board, slice the fig crumble bars into squares and serve. Store at room temperature in an airtight container. Enjoy within 3 days. I used less figs in the pictures shown above, however next time I would use more figs and layer them so they cover the entire crumble. In a large mixing bowl, combine the oat and brown rice flour, maple syrup, olive oil and sea salt. Spread the mixture evenly inside the bottom of the lined baking pan. Once the oven is heated, par-bake the mixture for about 10-15 minutes. Remove from the oven and allow to cool for a few minutes. Meanwhile, spread the sliced almonds onto a large baking sheet. Cook for 7-10 minutes, rotating halfway, or until golden (be careful not to burn! ).